He has 23 restaurants and three hotels, but the Michelin-starred superchef Alain Ducasse still finds time for exciting new projects, including a culinary arts certification program in Paris and an excellent new cooking app called My Culinary Encyclopedia. 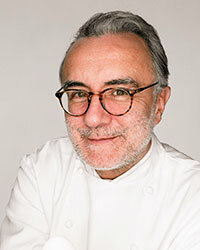 He has also returned to his early love of chocolate, opening Manufacture de Chocolat Alain Ducasse, a traditional Parisian chocolate workshop, in the city’s Bastille neighborhood. I am particularly proud of the Cookpot, a slow-cooked casserole of local, seasonal vegetables. For the dish contents, you need nothing more than a layer of a mushroom duxelles followed by a layer of alternating rows of sliced seasonal, local vegetables. The first dish I ever made myself was gâteau aux carottes or carrot pudding. It was the first recipe I made from Michel Guérard’s Cuisine Minceur cookbook, in 1975. I wish I were better at making chocolate. Toward the start of my career, working with Gaston Lenôtre, I discovered the world of chocolate. I was absolutely fascinated by its flavor, but I decided to stick to my first instinct to become a cook. What are the best bang-for-the-buck ingredients? The best bang-for-the-buck ingredients are olive oil and—when it comes to pastry—honey. It is best to avoid very sugary desserts, as the sugar overloads the taste buds and kills the flavor profile. What destination offers the best bang for the buck in food? Peru. Gastón Acurio, based in Lima, is doing an extraordinary job, looking to the South American terroir to bring to life a contemporary Andean cuisine. Do you have any favorite travel gear? Vintage luggage. For instance, I have some Samsonite suitcases from the 1960s, as well as Goyard luggage. Goyard, a 150-year-old leather tanner, crafted a trunk for my shoes, one for my knives and another one for my Michelin Guide collection. I would love to create the first restaurant ever on Mars. A few years ago, I developed meals for the astronauts of the European Space Agency, and if I could invent an imaginary restaurant, it would be in space. If you were bringing Mario Batali somewhere to eat, where would it be? I would love to invite him to picnic out of my 1950s Chevy pickup at La Bastide de Moustiers, my country hotel in Provence. We would pick the vegetables in the kitchen garden and prepare them together before heading out. Grains, particularly rice fonio and quinoa. To start with, they’re so good to eat! And not just that, grains are necessary for a balanced diet. They contain a whole array of vital nutrients. Do you have a favorite new store-bought ingredient? It’s not new, but it is timeless and delicious: Jean Paul Veziano’s pissaladière at his Boulangerie Veziano in Antibes. It’s like a tart made with onions and macerated small fish, and is a brilliant example of the humble Mediterranean cuisine I love so much.